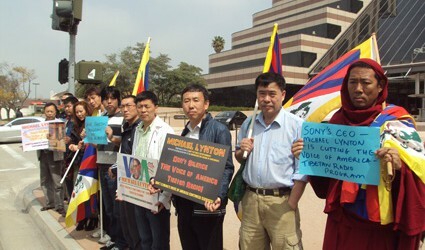 A group of Tibetans and human rights community supporters protested Friday in Los Angeles at the Sony Pictures Entertainment office against the planned silencing of the Voice of America (VOA) Tibetan radio programs by the Broadcasting Board of Governors (BBG), a US federal agency in charge of VOA and other US international broadcasts. Michael Lynton, one of President Obama’s close friends, serves as the BBG’s interim presiding governor. Lynton is the Chairman and CEO of Sony Pictures Entertainment. Sony Corp. announced that Lynton will be promoted to chief executive of all of Sony’s operations in the U.S. The Broadcasting Board of Governors wants to end Voice of America (VOA) radio news program to Tibet, Vietnam and Laos — all three nations ruled by repressive communist regimes. The Board also wants to close down the VOA Cantonese Service with its radio, television, and Internet news programs to China. In a move that will please Russia and its President-elect Vladimir Putin, the BBG also plans to end Radio Free Europe/Radio Liberty (RFE/RL) broadcasts in Chechen to Chechnya and Voice of America Georgian radio programs. Foreign policy experts say that the Chinese government will be pleased by the termination of VOA Tibetan and Cantonese broadcasts. The BBG continues to insist on ending VOA Tibetan radio broadcasts despite this week’s statement from the U.S. State Department spokeswoman Victoria Nuland who told reporters that China is aggravating the situation in the Tibetan region by its attacks on the Dalai Lama, Tibet’s spiritual leader-in-exile. The U.S. Senate Foreign Relations Committee has approved a resolution deploring what it calls “the repressive policies targeting Tibetans” and urges Beijing to resume talks with Tibetan Buddhist leaders, including the Dalai Lama. The resolution does not carry the weight of law, but it urges U.S. Secretary of State Hillary Clinton to seek a full accounting from Beijing on its ongoing crackdown, particularly at the flashpoint Kirti monastery. VOA’s Tibetan Service reported Wednesday that a 20-year-old monk named Lobsang Sherab set himself on fire in the main street of Cha township in China’s southwestern Sichuan province. Sherab was a member of the Kirti monastery, where anti-Beijing sentiment runs high. Sherab was the 20th Tibetan monk or nun who have died by self-immolation this year, with at least 10 others surviving their suicide attempts. BBG officials say that radio broadcasts to Tibet by Radio Free Asia (RFA), a semi-private broadcaster also funded and managed by the BBG, are sufficient even if there is a political and human rights crisis in Tibet. The Broadcasting Board of Governors apparently does not believe that the Voice of America serves as a powerful symbol of America’s support for the oppressed people around the world, a media and foreign policy expert told BBG Watch. According to this expert, the Voice of America is one of the few remaining tools for delivering uncensored news to Tibet from the United States. The continued existence of Voice of America Tibetan radio programs also sends public diplomacy messages to the Tibetans that their suffering will not ignored or forgotten by the American people, the expert said. The BBG cites tight budgets as the reason for the proposed cuts, but critics argue that the BBG’s out-of-control bureaucrats make these programming cuts to save their own jobs and those of big contractors. The BBG has awarded a 50 million dollar five year audience research contract to Gallup despite serious doubts about the value of conducting public opinion surveys on sensitive political and media issues in countries like China where the population is intimidated by a repressive regime. The BBG plans to drastically reduce other broadcasting programs, including English and Spanish-language Voice of America international news reporting and news from the United States. At the same time the BBG is building up its bureaucratic arm, the International Broadcasting Bureau (IBB), giving its executives large bonuses despite their official Office Personnel Management (OPM) rating as the worst leaders and managers in the federal government. Critics charge that the BBG is destroying America’s strategic information outreach to the world to feed its own bureaucracy. The bureaucratic arm of the BBG — the International Broadcasting Bureau (IBB) — is run by Richard Lobo, also one of President Obama’s close friends and supporters. Tell Michael Lynton to pay attention to the Tibetans who self-immolate to shock the conscience of the world. Shock Michael Lynton’s conscience by signing our petition. Tell Michael Lynton to save Voice of America radio broadcasts to Tibet, radio, TV, and Internet programs in Cantonese to China, and other American broadcasts and information programs to the world. Tell Michael Lynton to stop taxpayers’ wasting money on the International Broadcasting Bureau bureaucracy and their big contractors while people in Tibet, China, Vietnam, Laos and around the world want news, hope and support from America. In the past several months, the tragedy of series of self-immolation of Tibetan people happened in Tibet. Because of news blackout, few people know the truth. The cancellation of the Tibetan language radio service of the Voice of America (VOA) will worsen the condition of freedom of information for Tibetans in China. We hope Mr. Michael Lyton, the CEO of Sony Pictures Entertainment Global Communications and the Presiding Interim Chair for the Broadcasting Board of Governors (BBG), who supports VOA’s cuts, can change his mind and support the continuing of Tibetan radio service of VOA.